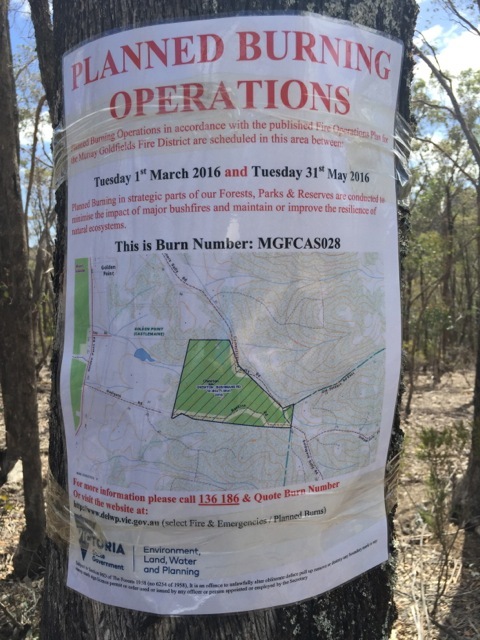 The proposed asset protection burn (triggered at the request of a neighbour) on the public reserve in Commissioners Gully Road didn’t take place, as listed, between 1 March and 31 May 2016. The Department of Environment and Primary Industry included the 12 hectare parcel of public land “Chewton Bushmans Road MGF CAS028″, otherwise known as the Chewton Bushlands Reserve (starting at the corner of Commisioners Gully Road and Rankins Road) in it’s Planned Burns this autumn just passed. We will update you when we know what the future now holds. A one to two metre strip has already been cleared around the perimeter of the Reserve and a pathway through has also been cleared. Around the base of the stringy barks and other trees will also be cleared to prevent the fire running up the trunks. On the day of the burn no-one is allowed on the land. DELWP workers will start at the top of the block and work down, allowing fauna an escape. The burn will be done all in the one day at the end of which they will have put out any fire around the perimeter. But the rest of the block will smoulder for perhaps a week or so, during which time they will monitor the block daily. This entry was posted	on Monday, February 22nd, 2016 at 1:24 am	and filed under • The bush, Fire. You can follow any responses to this entry through the RSS 2.0 feed. Hopefully, the asset burn will help to keep places from catching on fire. I have heard that controlled burns can help fire from jumping over to places that need to be protected. It would be a shame if the fire burned through towns and homes.